What's your summer skin care plan? Umbrella's, wide brimmed hats and a bevy of sun protection products or. . . The deeply tanned Beauty who uses baby oil, sun lamps and tanning booths? Summer evokes visions of beach beauties radiating gorgeous glistening bronzed skin, the "perfect" tan. Think about summer and your skin for a moment then stop and ask yourself. . .
"Who is the real Beauty on the Beach?" Is it the radiantly bronzed Beauty or is it the hidden Beauty lounging under the beach umbrella, slathered in sunscreen from head to toe sporting large dark sunglasses, a wide brimmed hat, and a full length beach cover-up? You know the answer to that one already, don't you? In the heat of that moment of summer sun it appears that the deeply bronzed beach Beauty is clearly winner doesn't it? It's really the hidden Beauty enjoying all the wonder that the beach offers without surrendering her skin to the onslaught of aging UV rays. Summer skin care and sun protection products are silently working wonders for her skin! Over time, the beautiful bronzed Beauty will gradually develop all sorts of sun signs of damage like hyperpigmentation, age spots, wrinkles and tough leathery skin while the hidden Beauty's skin will continue to radiate the essence of youth. The sun signs of damage. . .
See what happens to your skin over time? Quite simply it is because 90% of all signs of aging skin are a direct result of sun damage! 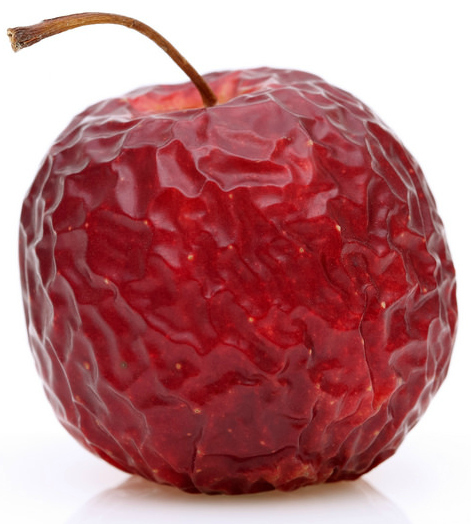 Think of it this way, have you ever left a piece of fruit in the sun only to discover later that it has become totally dehydrated, shrunken, leathery, wrinkled and completely covered in ugly brown and black spots? That is exactly what happens to your skin over time. Sun damage is cumulative over the course of your life which means that gradually, year after year, sun damage continues to accrue. 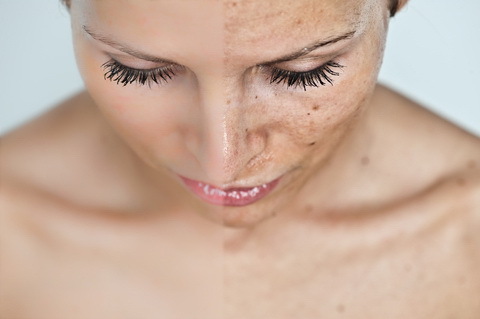 It's important to understand a little background information on sun damage. Do you know how and why the skin tans? The brown pigment that creates a tanned appearance is melanin which forms to serve as a barrier to block the sun's ultraviolet rays and to protect the skin from damage. Without the use of sun protection products, ultraviolet, (UV), radiation on both the UVA and UVB spectrum causes skin damage which takes the form of sunburned skin, hyperpigmentation, age spots, wrinkles as well as skin cancer. Ultraviolet light increases free radical activity which in turn increases cellular damage. 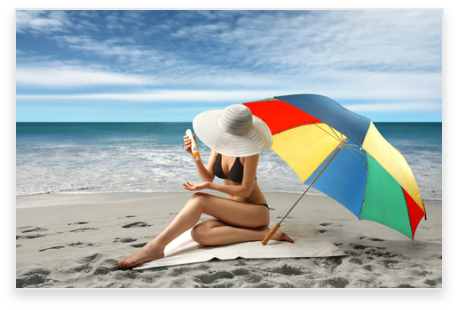 So start early, start young, and throughout your life make a commitment to consistently practice summer skin care strategies like the hidden Beauty at the beach by lounging under an umbrella and using sun protection products. Your skin will show it’s appreciation by maintaining its health and a lovely youthful glow as you age. Summer skin care employs a variety of tried and tested effective techniques which serve to protect the skin by taking advantage of rich antioxidant moisturizers, exfoliating away dead skin cells, keeping the skin hydrated by drinking LOTS of liquid, using skin care treatments that seal in moisture and using sun protection products religiously. Gently cleanse and tone the skin each morning. It is also helpful to keep a light, moisture rich toner in your bag to use for a quick cleansing yet moisturizing treatment throughout the day. Each and every day establish a skin care routine that involves the application of an anti-aging moisturizer in the AM and PM with an antioxidant ingredient. Antioxidants have been clinically proven to successfully help protect the skin as well as to promote healing. Use the best sunscreen or sun block you can find each and every morning. Re-apply throughout the day as necessary to prevent sun damage. Get yourself a nice wide brimmed which will also help protect your skin. Use a facial mist rich in nutrients on hot summer days to help to keep the skin hydrated along with drinking a lot of liquid. Exfoliate regularly using a chemical exfoliant such as glycolic acid or microdermabrasion scrub to rid the ski of dead skin cells, promote new cell growth and prevent acne outbreaks which occur way too frequently during the hot summer months. Dust off your facial steamers and give yourself a weekly steam to open and deeply clean pores. Treat yourself to deep facial masks to hydrate the skin a few times a week. Hydroquinone products or other mild bleaching creams along with a vitamin A retinol moisturizer will help tackle any evidence of hyperpigmentation. An occasional natural skincare facial peel is beneficial in stimulating cell renewal as well as treating a variety of skin aging issues. Not mention that you'll love how good your skin looks in the years to come! Quick Search for all Your Summer Skin Care Needs. . .